- The client assumes full financial liability for any damage to the limousine caused during the duration of the rental by them or any members of their party. - Drug use is prohibited by law. Any fines will be paid for by the customer. - Underage drinking is illigal. Stretch Limousine, Inc has a zero-tolerance policy. - In the event that a client becomes physically sick and soils the limo, $250 professional clean up/sanitation fee will be automatically added to basic limo charges. - The driver has the right to terminate run without refund (if there is blatant indiscretion on the part of the client(s)). - It is illegal to stand through the sunroof. Smoking is illegal and not permitted in our limousines. - If at any moment during the service you are not fully satisfied with our service, please contact our dispatch at 773-230-1637 immediately. - Actual total amount due will be calculated upon completion of the trip. - Stretch Limousine, Inc. is not liable in the event of mechanical breakdown while on charter and will only be responsible for making up lost time at a mutually agreed date. - Stretch Limousine, Inc. does not accept responsibility for delayed travel time due to unforeseen weather, traffic, road conditions (for example, unsafe road conditions in winter (ie. not salted, accidents, etc. )), or delays beyond our control. - Stretch Limousine, Inc. is not responsible for articles left in our vehicles. - Balances to be paid to the driver on the run date before the beginning of the run (at the initial pick-up location) unless paid with a previously authorized credit card. - Vehicles cannot be loaded beyond seating capacity. - All deposits are non-refundable. The idea of the deposit is to hold a reservation and take a vehicle of your choice off the market until the date of service. - To accommodate clients with children, we carry a variety of child seats and boosters; however, drivers can only assist passengers with installation of each car seat. It is customer's responsibility to secure each child car seat or booster seat. See how we handle Service Issues if any. - RESCHEDULING/CANCELLATION is possible at no extra charge, as long as rescheduling/cancellation is requested more than 24 hours before the scheduled pick-up time. A cancellation fee of 20% (equal to gratuity) will be charged for any cancellation made between 2-24 hours before the scheduled pick-up time. A cancellation fee equal to the cost of trip plus 20% service fee (equal to gratuity) will be charged for any cancellation made less than 2 hours before the scheduled pick-up time. - A no-show fee equal to the trip cost plus 20% gratuity (minimum of $65), including waiting time will be charged when the passenger fails to show at the designated location or cancels the reservation after our vehicle was dispatched. If you cannot locate your sedan/limousine, please call 773-230-1637 to avoid a no-show billing. - Stretch Limousine, Inc. monitors all flights and adjusts scheduling accordingly. We cannot guarantee availability of a vehicle when flights are more than 45 minute late. In this case the availability is on a best effort basis only. - Stretch Limousine, Inc. grants a sixty (60) minute grace period after the reported domestic flight arrival time and a sixty (120) minute grace period after reported international flight arrival time. Once grace period has elapsed and the customer has not called, the car will be dismissed and all applicable fees will be included. - A 20% standard gratuity, based on the fare, stop time, and wait time will be added to your bill. All out of packet charges, including tolls, parking, and airport fees will also be added. - Additional stops en-route are charged a $10.00 per stop in a sedan, $20.00 per stop in a stretch limousine, and at $1.00 increment, not to include standard gratuity and STC. - For all services paid with a credit card, we require a physical imprint of the card used to make a reservation. For security reasons, our driver will imprint your credit at the time of service and obtain the signature of a card holder. - Waiting time: For all pick-ups, a fifteen (15) minute grace period is granted. Once the grace period has elapsed, waiting time is charged at $5.00 per five minute increment, from original/scheduled pick-up/drop-off time. If a financial arrangement is not made with our driver, for example: balance is paid in cash, additional wait time fee will be charged to the credit card used to make a reservation. - Stops en-route are charged a $10.00 per stop in a sedan, $20.00 per stop in a stretch limousine, and at $1.00 increment, not to include extra mileage. - Since pick-up/drop (point-to-point) service is a discounted service, soda on board is provided complementarily from a driver. For additional fee, Any alcohol (including beer and champagne) needs to be ordered at the time of booking. - We will honor discounted rates advertised on a web site only if you schedule extended number of hours in advance. - For all services paid with a credit card, we require a physical imprint of the card used to make a reservation or credit card authorization form faxed to our office to confirm you reservation. - For all hourly charters including weddings, we have a 3-hour minimum policy and 30% non-refundable deposit (minimum of $100) is required. - A 30% service fee (equal to non-refundable deposit), based on the fare, will be charged when cancellation is requested more than 48 hours before the scheduled pick-up time. - A cancellation fee equal to the 50% cost of trip plus 20% service fee will be charged for any cancellation made between 24 to 48 hours before the scheduled pick-up time. - A cancellation fee equal to the cost of trip plus 20% service fee will be charged for any cancellation made less than 24 hours before the scheduled pick-up time. - A no-show fee equal to the trip cost plus 20% service fee, including waiting time will be charged when the passenger fails to show at the designated location. If you cannot locate your sedan/limousine, please call 773-230-1637 to avoid a no-show billing. - Waiting time: For all hourly charters, a fifteen (15) minute grace period is granted. Once the grace period has elapsed, waiting time is charged at the rate of your hourly charter in 30 minute increments (30 min minimum), from original/scheduled pick-up/drop-off time. If a financial arrangement is not made with our driver, for example: balance is paid in cash, additional wait time fee will be charged to the credit card used to make a reservation. - There will be no refund for any unused time. Your vehicles is reserved for you and you are free to keep your vehicles until the end of your scheduled time. - In every hourly charter, water, soda and beer on ice is included at no cost. 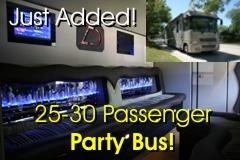 - Unlimited stops and pick-up locations are included. RATE DISCLAIMER: All online reservations are subject to availability. Blackout dates may apply. 20% standard gratuity, STC (Standard Transportation Charge that includes fuel surcharge & tolls), and airport tax will be automaticly added to your reservation. Rates are subject to change without notice. $10 - Late evening / early morning pick-up fee will be added for all pick-ups between 11.00pm-12.00am & between 4.00am-5.00am. $25 - Holiday Surcharge will be added for all reservations on New Years Eve, New Years Day, Memorial Day, Independence Day, Labor Day and Thanksgiving. PAYMENT DISCLAMER: For all reservations we require full major credit card information including CCV number (security code) and billing address. Credit card is a primary and default form of payment; however, we also accept cash to the driver if specifically requested. Direct bill is only available to long-term clients with well-established relationship with Stretch Limousine, Inc.
CREDIT CARDS PAYMENTS ONLY: After we receive your reservation, our reservation representative will process your reservation and authorize your credit card for a full trip amount including gratuity and airport tax /tolls. As required by our credit card merchant/processor, we must obtain a signature of the credit card holder and the physical imprint of your credit card at the time of service. Please have this credit card handy at the time of service. If you do not want a passenger to be responsible for billing (for example, you want to prepay for a family member, friend, co-worker, boss etc), please fax a Credit Card Authorization Form to our office (fax number will be on a form). CASH PAYMENTS ONLY: If you decide to pay cash to the driver, please mention this in Notes/Comments/Preferences during your reservation process. Also, please advise that we will still require and authorize your credit card for full trip amount including gratuity to hold your reservation and dispatch a vehicle. After your cash payment is made to the driver, we will void credit card authorization within 24-48 hours. Thank you for choosing Stretch Limousine, Inc.